It’s simple! 20 lucky eLearners, fans … fellow helmsmen … will be randomly selected for a VIP meet-and-greet experience at #DevLearn 2017. 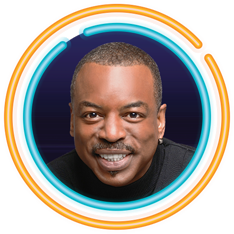 To enter, all you have to do is tell us in a sentence or two why you’d like to meet LeVar Burton. Share your reason using the #MeetLeVar and #DevLearn hashtags on Twitter, Facebook, Instagram, or by email to DevLearn@eLearningGuild.com. Your post or email will count as your entry into the sweepstakes. Keep in mind: While you can share as many reasons as you’d like, we’ll only count one entry per person, and the winners will be chosen at random. The 20 VIPs will meet LeVar following his keynote session on Thursday, October 26.